U. F. Grant seldom did live lectures. One of the few he did was for the Magician's Guild of American in New York City on Oct. 13, 1952. These are the original lecture notes. 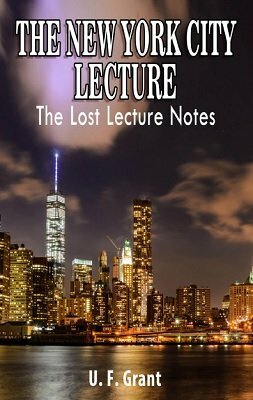 These notes are very rare and almost impossible to find as they were sold only at the lecture and not distributed through magic dealers. Here are the contents; none require any difficult sleights and all are easy to do. Bombay Rope Cut: A cut and restored rope that involves tying no knots. Zella Ring on Rope: A spectator ties the ends of a length of rope together. The performer then passes a borrowed ring onto the rope, without untying the knots. Both rope and ring may be examined. Half-Dollar Location: A card is selected and returned to deck. Vanish a half-dollar and it appears in deck on top of selected card. Rub Location: The performer causes an indifferent card to change to a selected card by rubbing it on his knee, no double lift or top change. Three-Way Card Stab: Three cards selected and returned to deck. Anyone stabs a knife into the deck and the two cards on both sides of knife are the selected cards. Performer reaches into his pocket and removes the third selected card. No sleights or palming. Sloane Sucker Napkin Tear: A new version of the sucker torn and restored napkin. Zenith Nest Of Boxes: A borrowed coin flies from one nest of boxes to another. Very clever, only one quarter is used and it is marked. Zenith Torn Bill Production: An effect not seen today, tear and restore a bill and then produce six more dollar bills from your empty hands. No sleights. Self-contained. Zella Bill Switch: Performer caused a five-dollar bill in the spectator's pocket to change places with a one-dollar bill in his pocket. Everything can be examined. Ace Location: The spectator cuts to the four aces in shuffled deck. Very baffling. Vanishing Deck: The performer has three cards selected and returned to the deck. The deck is then covered with a handkerchief and the performer then proceeds to produce the selected cards from the deck under the handkerchief. After the three cards have been produced the performer whips the handkerchief away and the rest of the deck has vanished. Bagged: A pencil is pushed through the sides of an empty paper bag and given to a spectator to hold. A borrowed ring is vanished and appears inside the bag onto the middle of the pencil while a spectator is holding both ends of the pencil. Vanishing Billiard Ball: A billiard ball is tossed into a clear glass tumbler and the tumbler is covered with a handkerchief. The handkerchief is immediately removed and the billiard ball has vanished. Coin Glass: An unprepared clear goblet that will deliver a load of coins into your hand for production. Coin Thru Handkerchief: Wherein, a borrowed half dollar passes visibly thru the center of a handkerchief. Grant's Ellis Ring Routine: Those who have this wonderful little ring will appreciate my routine with it. It is a clean and convincing routine and leaves you with nothing to get rid of at the finish. 1st edition 1952, 1st digital edition 2017, 12 pages.